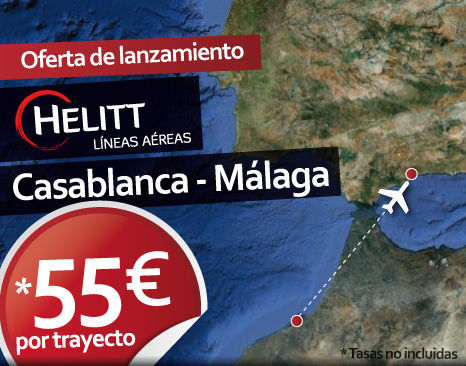 Helitt Airlines will begin operating from today a new flight joining Malaga and Casablanca (Morocco). This route with a frequency of four weekly flights will operate on Mondays, Wednesdays, Fridays and Sundays. The company, based at Malaga airport, flies from the capital of the Costa del Sol to three peninsular destinations – Barcelona, Madrid and Badajoz – and Melilla and Mallorca. For the summer months are scheduled flights between the three Balearic Islands. As of June 15 will be available flights between Mallorca and Menorca, with three weekly flights -Monday, Tuesday and Wednesday, and between Mallorca and Ibiza, with two weekly frequencies.